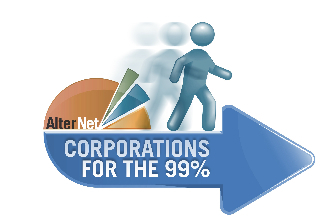 Corporations are not working for the 99 percent. But this wasn’t always the case. In a special five-part AlterNet series, William Lazonick, professor at UMass, president of the Academic-Industry Research Network, and a leading expert on the business corporation, along with journalist Ken Jacobson and AlterNet’s Lynn Parramore, will examine the foundations, history and purpose of the corporation to answer this vital question: How can the public take control of the business corporation and make it work for the real economy? Since this sentiment is so familiar, it may come as a surprise that it is factually incorrect: In reality, there is nothing in any U.S. statute, federal or state, that requires corporations to maximize their profits. More surprising still is that, in this instance, the untruth was not uttered as propaganda by a corporate lobbyist but presented as a fact of life by one of the leading lights of the Democratic Party’s progressive wing, Sen. Al Franken. Considering its source, Franken’s statement says less about the nature of a U.S. business corporation’s legal obligations – about which it simply misses the boat – than it does about the point to which laissez-faire ideology has wormed its way into the American mind. The notion that the law imposes a duty to “maximize shareholder value” – a phrase capturing the notion that profits are mandatory and it is the shareholders who are entitled to them – is so readily accepted these days because it jibes perfectly with assumptions about economic life that constantly come down to us from business and political leaders, from academia, and from the preponderance of the media. It is unlikely to occur to anyone under the age of 40 to question this idea – or the idea that the highest, or even sole, purpose of a corporation is to make a profit – because they have rarely if ever been exposed to an alternative view. Those in middle age or beyond may have trouble remembering a time when the corporation’s focus on shareholders’ interests to the exclusion of all other constituencies –customers, employees, suppliers, creditors, the communities in which it operates, and the nation – did not seem second nature. This doctrine, known as “shareholder primacy,” now reigns in the corporate world today, and it has so increased the power of those whom it has benefited that it will not be easy to dislodge. Those who propagate it believe, or would have us believe, that it is based in law; in fact, it is supported by no more than ideology. They believe, or would have us believe, that it reflects incontrovertible and eternal truths; in fact, it is an expression of transient self-interest. They believe, or would have us believe, that it honors long precedent – but, as we have seen, its ascendency is recent, and, rather than honor it undermines precedent. Yet despite these contradictions, corporations and their allies have been exceedingly successful at selling their viewpoint to the American people. An important step toward countering their influence can come in refusing to accept the legitimacy of shareholder primacy. Up to now, this fad has had the power to neutralize opposition in part because it has obscured the tool needed to challenge it: a clear understanding of the economic realities. For this reason, we must learn what contributions all stakeholders – not just the shareholders, but all the others as well – make to the corporation, and the extent of the risks and rewards those contributions truly entail. We must learn about the interrelation of business and government in all its complexity, going far beyond the headlines about taxes and regulation to discover who needs whom for what, and who does what for whom. And we must learn what rights corporations legitimately hold, what privileges they enjoy, and what duties they are obliged to carry out. Without this effort, without this knowledge, we are in danger of continuing to be held captive by a fad.